The 6.5-mile-long section of the Branch Avenue Route (F Route), between Anacostia Station and Branch Avenue Station, which carries Green Line trains, opened on January 13, 2001, completing construction of the originally planned 103-mile-long, with 83 stations, Adopted Regional System (ARS) of the WMATA Metrorail system, which began construction in D.C. on the Red Line at Judiciary Square in 1969. This new section cost $900 million for engineering, right-of-way and construction, and it added five new stations to the system: Congress Heights, Southern Avenue, Naylor Road, Suitland, and Branch Avenue. This new section extends from the previous terminus at Anacostia Station in the District of Columbia, to near Branch Avenue and the I-95/I-495 Capital Beltway in Prince George's County, Maryland. WMATA projected that this will add about 20,000 new daily riders to the system, and news reports a week after the opening show that the figure has been exceeded considerably. From WMATA's website just before the opening, "The five-station Green Line extension to Branch Avenue is set to open Saturday, January 13, 2001, marking completion of the originally-planned, 103-mile Metrorail system". "Welcome to the new Green Line stations - Ahead of schedule and under budget, the Green Line will open doors to new communities for Metro customers in the District of Columbia and Prince George's County, Maryland. Join us for the opening day celebrations, 10:30 a.m. at the new Congress Heights station and Noon at the new Branch Avenue station on January 13 and get tickets good for a free round-trip ride between 10 a.m. and 4 p.m. that day". Naylor Road station wins design award "Green Line Update - Find the latest news on the completion of the Green Line, as well as interesting facts about the area around the new stations". See - The Green Line Update. I attended the opening ceremonies, and rode the new extension and stopped at all the new stations and took photos, and I have posted them on the station links at the bottom of this page. They had opening ceremonies at Congress Heights Station and at Branch Avenue Station, with speeches by various dignitaries. The highest officials speaking were Maryland Governor Glendening and both U.S. Senators from Maryland; speaking at the Branch Avenue Station. Since the Branch Avenue Station is in Maryland, its opening ceremonies focused mostly on Maryland, and since the Congress Heights Station is in D.C., its opening ceremonies focused mostly on D.C. The construction of the Green Line extension marks the completion of the originally planned 103-mile Metrorail system. The new five-mile section picks up where the Anacostia Station leaves off, running southeast into Prince George's with stations at Congress Heights in the District, and at Southern Avenue, Naylor Road, Suitland and Branch Avenue in Prince George's. Many hope that Metrorail will prove not only a more convenient mode of transport but also an engine for economic growth that will transform this struggling inside-the-Beltway corridor -- which includes Congress Heights, Hillcrest Heights, Suitland and Temple Hills -- into a lively commercial and residential center. The community around the Congress Heights Station has long been one of the poorest in the District. It mainly consists of large tracts of brick apartment complexes, some of them boarded up, and it has few businesses other than liquor stores, beauty salons and tax preparation offices. In contrast, the stretch between the Southern Avenue and Branch Avenue stations was once considered an attractive suburb of single-family homes and thriving shopping malls. But during the last couple of decades, the area fell into decline as its malls were eclipsed by newer, more-upscale shopping centers in Northern Virginia and other parts of Maryland. The greatest potential for another Metro miracle is around the Branch Avenue Station, officials say. The last station on the line, Branch Avenue will see the largest portion of the 27,000 daily passenger boardings expected on the Green Line extension. It is also next to a 106-acre private lot whose owner has proposed building a "town center" with 500,000 to 2.7 million square feet of office space, 10,000 to 250,000 square feet of retail space, and 1,200 to 2,500 apartment units. Parking is not expected to be a problem on this new section. The least amount of parking of all the five new stations is available at Congress Heights (65 Kiss-and-Ride, 70 metered spots) and Naylor Road (400 long-term and 64 Kiss-and-Ride spots). Southern Avenue has 2,200 long-term parking spaces while Suitland has 2,000 and Branch Avenue 3,000. Of the three types of line placement (subway, surface and aerial), no one type predominates on the 6.5-mile-long segment between Anacostia Station and Branch Avenue Station that just opened. In terms of mileage, it has about 1/3 of each type. Also, there is a lot of vertical curvature on the roadbed of this segment, since it follows gently rolling terrain, and because of the transitions between line placement type. Incidentally, during the initial planning and design of the WMATA system in the 1960s and 1970s, the planners decided to use the word 'aerial' instead of 'elevated', for the specific reason that they did not want the public to associate the proposed aesthetically designed modern concrete structures, with the old fashioned "El" structures in New York City, Philadelphia and Chicago. So, the reason was for marketing. As the first riders of the Branch Avenue station board the train, one of the most acrimonious battles any community has seen over the Washington mass transit system will come to a joyous end. The people living around Branch Avenue and Auth Road wanted it to end there, at the original terminus Maryland voters first approved in 1968, to serve the businesses of what was then known as "the strip" and the homes there. However, problems with the alignment in Washington gave a group of county leaders - including then-County Councilman Parris N. Glendening and then-state Sen. Steny H. Hoyer - momentum to shift the county's line three miles south to end at Rosecroft Raceway. "The people in the Branch Avenue area wanted it," remembered Lorraine Sheehan, then a state delegate and later secretary of state under former Gov. Harry Hughes, who led a grass-roots fight for the Branch Avenue station. "The people in Rosecroft did not. ... The powers that be were sending it where the folks didn't want it. We were a ragtag band of agitators taking on the Prince George's County powers. It was very significant". When the County Council and Washington Metropolitan Area Transit Authority moved ahead with plans to locate the station at Rosecroft, the Branch Avenue proponents sued. The judge, dismayed by improper public hearings held by the council, put the entire project on hold. A newly elected council, spurred by then-Councilwoman Sue V. Mills, debated the issue again in 1983, and a 4-4 vote changed the location by default - back to its original location at Branch Avenue. By then the fate of the end of the Green Line was sealed: it would be the last to open of the original 103-mile, 83-station Metrorail system. Without a plan Metro could legally pursue, "the money shifted from Prince George's to Northern Virginia. It set us back 20 years," said state Sen. Gloria Lawlah, D-Hillcrest Heights, then a proponent of the Branch Avenue plan. Ronald H. Deiter, in his book The Story of Metro, 1989 revision, documents the controversy in depth. My synopsis of his excellent, well-referenced history follows. The ARS of 1968 showed the Branch Avenue Route crossing the Anacostia River near the 11th Street Bridge, and roughly following Good Hope Road in the District of Columbia and the Suitland Parkway in Prince George's County, Maryland, to a terminus near the interchange of Branch Avenue and the Capital Beltway. The first problems arose in 1976 when it became evident that the Anacostia River crossing would be a lot more expensive and difficult to build than expected; also, that the neighborhood disruption and demolition along Good Hope Road would be excessive. The route between southeast D.C. and Branch Avenue was restudied by WMATA, with input from D.C. and Prince George's County. The District and the county offered new alternatives. When the restudy came along, both D.C. and Prince George's County had alternatives to offer. The District wanted the route to cross the river a little further west, for easier construction, and to serve the Congress Heights neighborhood, for greater ridership potential. The County, using this rerouting, officially advocated a route southward to the vicinity of Rosecroft Raceway instead of eastward to Branch Avenue. The Rosecroft Raceway is about a mile south of the interchange of the I-95/I-495 Capital Beltway and MD-414 Saint Barnabas Road. There were public charges from private citizens as well as from some county officials, that the choice of the Rosecroft Route had been made under pressure from wealthy, politically powerful landowners. When the County held public hearings about the possible route shift in December 1977, both routes (the original Branch Avenue Route and the new Rosecroft Route concept) received strong support. In June 1978, WMATA approved the District portion of the rerouting, including the westward shift of the Anacostia River crossing, which required the westward relocation of the proposed Navy Yard Station in southeast D.C. Final design work started on this route between Waterfront Station and Congress Heights Station. The County vacillated for almost two years on which route to recommend, but finally in March 1980, it asked for the Rosecroft Route, and WMATA agreed with that route. The proposed opening date for the route at that time it was 1986. Soon after the decision, supporters of the Branch Avenue Route went to court. In February, 1981, the U.S. District Court for Maryland, with Judge Norman P. Ramsey presiding, ruled that the December 1977 hearings, both in D.C. and in P.G. County, were invalid because insufficient public notice had been given. The court injunction ordered that all work beyond Waterfront Station be stopped, including a contract for the river tunnels that was about to be awarded. The court ordered that the original ARS Branch Avenue Route, which WMATA had already decided was infeasible, was the only one on which work could proceed. If the route was to be changed, then new public hearings must be held. The new hearings were well publicized, and were held in both the District and the County in June 1982. When the WMATA staff presented the results of these hearings to the WMATA Board of Directors, it did not (as was usual in their reports) give its own recommendations, but only listed the alternatives with their pros and cons. The Board, in November, 1982, resolved to proceed with the Rosecroft Route it had already approved in 1978 and 1980, following its customarily practice of going along with the wishes of the representatives of the city or county involved. In still another lawsuit and court decision in October, 1983, Judge Ramsey ruled that WMATA still had not satisfied the requirements for proper public hearings; specifically that WMATA had not given sufficient consideration to pro-Branch Avenue Route arguments. WMATA decided not to appeal, and in November, 1983, the Prince George's County Council reversed its earlier decisions and approved a Branch Avenue Route. A third set of public hearings was held in July 1984, presenting the original Rosecroft Route and a Branch Avenue Route with the D.C. portion rerouted through Congress Heights. In December, 1984, the WMATA Board approved the Branch Avenue Route via Congress Heights. The line follows the proposed Rosecroft Route between southeast D.C. and Congress Heights, just south of St. Elizabeth's Hospital, and then it turns northeastward along Southern Avenue to rejoin the originally-proposed Branch Avenue Route of the 1968 ARS. The Branch Avenue Station terminal was shifted also; the 1968 ARS showed it at Branch Avenue about a mile west of the Capital Beltway, and the new location put it at Auth Way about 1/3 mile from Branch Avenue. This route as detailed in this paragraph was what was actually built 1996-2001. This decision also added two miles to the total Metrorail system mileage, so the "101-mile system" became the "103-mile system" at this point. Map section on "Your Guide to Metro", by WMATA, 1998, used to show the evolution of this corridor. I used a green highlighter pen to show the proposed route, with blue dots for the proposed stations. Here is a link to a map of the Branch Avenue Route as it was built: Final Branch Avenue Route (101K). Here is a link to a map of the Branch Avenue Route as it was originally proposed in the 1968 ARS: Original Branch Avenue Route (105K). 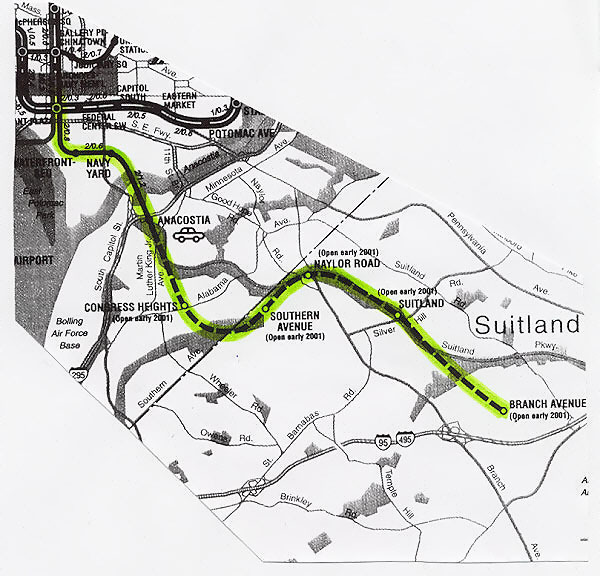 This route proposal had stations at Waterfront, Navy Yard, Anacostia, Alabama Avenue, Naylor Road, Suitland, and Branch Avenue. (Source: Regional Metro System map by WMATA, 1968). Here is a link to a map showing the Rosecroft Route as it was proposed: Rosecroft Route (105K). This route proposal had stations at Waterfront, Navy Yard, Anacostia, Alabama Avenue (in Congress Heights), Southern Avenue, Saint Barnabas, and Rosecroft. (Source: Regional Rapid Rail Transit System map by WMATA, 1980). The following information (blue text) comes from newsgroup posts by John R. Cambron of North Beach, Maryland. John is a transit and road researcher and a knowledgeable regular poster in the Usenet newsgroups news:misc.transport.urban-transit and news:misc.transport.road; these are professional newsgroups on the Internet that cover mass transit and roads/highways. John, like myself, has been following the Metro system's development and construction from the very beginning in 1969, and John knows this railroad very well. Scott Kozel and I toured the five new stations that opened on the Green Line F Route 01-13-2001. This completes the 32 year construction project of the 103-mile WMATA Metrorail network. OK, now to the description of the line and stations. Congress Heights is the first of the new stations south of the Anacostia Station and it is also the last station in subway to be built as part of the 103 mile ARS. The station is a cut-and-cover 6-coffer vault type station with the fare collection mezzanine in the trainhall at the south end of the station. Two surface entrances with escalators access the passageway connecting to the fare collection mezzanine along with an elevator. The entrance on the south side of Alabama Avenue has 2 escalators descending north on the same tangent as the trainhall, the entrance on the north side of the street descends in the opposite direction with 3 escalators and a stair on the east side of the trainhall with the elevator around the corner to the right at the bottom of the escalators. The design of the passageway is typical of WMATA subway architecture. The surface entrances have glass roofs covering the entrances similar to the roofs used at Colombia Heights and Georgia Avenue-Petworth. There is a kiss-and-ride lot and off-street bus terminal adjacent to the south entrance. Architecturally the 3 surface stations Southern Avenue, Suitland, and Branch Avenue are very much the same. These stations all have a similar mezzanine and station canopy design and layout with a single mezzanine at one end of the station; Southern Avenue south (inbound) end, Suitland south end, Branch Avenue north end. Southern Avenue and Suitland have pedestrian bridges over the bus terminal to allow access to the station from the parking structures and kiss-and-ride lots without having to cross the bus terminal access road at grade. Southern Avenue and Branch Avenue mezzanines are accessible from both sides of the station, Suitland does not as the west side of the station abuts the Suitland Parkway. Naylor Road is elevated with a platform canopy of the same design as the other surface stations, the station fare collection mezzanine is just west (inbound) of mid platform at grade, it has all of the same facilities found at the other surface stations; parking lots/structures, bus terminal, kiss and ride and metered short term parking. Go to: http://www.wmata.com/metrorail/STATNS.HTM and click on the link to the station, at the bottom of each page is a link to a map of the close-in station area. The line consists of shield bored and cut-and-cover tunnels north of Congress Heights, shield bored tunnels between Congress Heights and Southern Avenue; at grade, retained cuts, short bridges using concrete beams, and post tensioned continuous box girders between Southern Avenue and Naylor Road; post tensioned continuous box girder, at grade, retained cuts between Naylor Road and Suitland; cut and cover tunnels, retained cuts, at grade, and post tensioned continuous box girders between Suitland and Branch Avenue. Here's John's WMATA Metro and Other Stuff website. The opening of the remainder of the Branch Avenue Route has generated new ridership on the Metro system, and the new line is already seeing congestion. WMATA has 192 new rail cars on order, to be delivered later in 2001, to add to its current fleet of 764 rail cars. WMATA managed to muster 26 cars from the rest of the system so that this opening could take place in January rather than in March like originally planned. The system was originally planned to have a maximum operation of eight-car trains running on 4-minute headways on each line (Red, Blue, Orange, Yellow, Green) during peak hours, and that would provide 2-minute headways where two lines run together on one route segment (Blue-Orange, Blue-Yellow, and Yellow-Green). The current rail fleet is nowhere near large enough to provide that kind of service, and the best density currently available is six-car trains on 6-minute headways on each line, with 3-minute headways where two lines run together on one route segment and on some portions of the Red Line. The station platforms are 600 feet long, long enough for eight-car trains, but apparently WMATA officials and engineers question whether there is enough traction power available in the system's electric power sub-stations to provide for a maximum operation of eight-car trains running on 4-minute headways on each line. The issue of running eight-car trains during peak hours is under study by WMATA as I write this article in January 2001, and the ATC (Automatic Train Control) system as well as the traction power system is being evaluated to see if this is feasible without major upgrades. Metrorail cars operate in "married pairs", so the train consist configurations possible are, two cars, four cars, six cars, or eight cars. Metro expected that after six months of service, the new Green Line stations would generate 18,000 new passengers. But on Wednesday, the second day of regular service, the stations beat that goal -- 19,517 passengers boarded trains at Branch Avenue, Suitland, Naylor Road, Southern Avenue and Congress Heights. Metro officials scrambled yesterday to add some rail cars to Green Line trains, pulling them out of service from other parts of the system. The Green Line typically runs four-car trains during rush hour while other lines have six-car trains. But last evening, Metro added three six-car trains to the line, and will add two additional six-car trains to rush-hour service next week, [Metro spokesman Ray] Feldmann said. Metro is struggling with a rail car shortage as it waits for 192 new rail cars to become ready for service later this year. On Tuesday, January 16, the first full day of regular commuting on Metro's five newest stations on the Green Line (Branch Avenue, Suitland, Naylor Road, Southern Avenue and Congress Heights), ridership numbers far exceeded anticipated projections. At the end of the service day, approximately 26,847 trips were taken by customers. Of those trips, 14,777 were new riders. Metro projected 22,000 daily customers would utilize the stations after the first six months with new riders making up 18,000 of the projected ridership. Even as the original 103-mile ARS (Adopted Regional System) was being completed in January 2001, work on expanding the system was already underway. A WMATA news release in December 2000 announced the beginning of construction for the infill New York Avenue Station on the Glenmont Route (Red Line trains) near the intersection of New York Avenue and Florida Avenue, N.E. This is the first new rail station beyond the original 103-mile system. See - New York Avenue Station WMATA Fact Sheet. When I was at the opening ceremonies on January 13, 2001 for the last 6.5 miles of the Branch Avenue Route (Green Line trains), I saw the latest Metro system map on the wall of the stations and trains, and it shows the proposed New York Avenue Station and the proposed 4-mile-long Largo Extension. The Largo Extension will be the first extension beyond the 103-mile-long ARS, and it will run from the existing Addison Road Station to the Largo Town Center Station, including a Summerfield Station between Addison Road and Largo Town Center. Part of the new line will be in subway, part on the surface, and part aerial, and both new stations will be on the surface. It will carry Blue Line trains. Prince George's County MD was the last jurisdiction to see its original Metro system completed, and it will be the first to get an extension. So the current ARS is 107 miles long with 86 stations, and includes the New York Avenue Station and the Largo Extension. Construction has begun on the $75 million New York Avenue station on the Red Line, the first station to be built in the middle of an existing line. It is expected to open in 2004. Metro will break ground this month on a $434 million project to stretch the Blue Line to Largo -- less than a mile from the Redskins' FedEx Field -- by 2005. And environmental studies have begun on a plan to extend rail lines to Tysons Corner and Dulles International Airport. I see that on August 18, 2001, that a number of the above external links are no longer active. My material and all photos © Copyright January 2001 by Scott Kozel, all photography by same. All rights reserved. Official website Washington Metropolitan Area Transit Authority (WMATA). Here is the official WMATA System Map. Here is the official WMATA History Link (Adobe .pdf format document).